If you are employed right now, do you feel limited by your opportunities for growth? That’s a good thing! While you might feel like limitations are holding you back right now, they might be your new best friend in you decided to become self-employed. 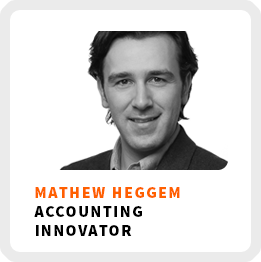 Our guest today, Mathew Heggem explain how limitations create opportunity. He is a self-described modern-day renaissance man, known as the “Dancing CEO” (you’ll discover why when you listen to his interview) and is the co-founder of SUM Innovation, a next generation accounting firm redefining the accounting industry. He says he helps business grow through numbers. Why growth comes from limitations. How to remove limitations to uncover new opportunities. How automation is changing the accounting profession and creating new opportunities. Wake up time: Between 6:00 and 7:00am. Ideal work environment: For some work, like emails, it’s while he is traveling. For creative work and thinking, he prefers working at home. Definition of success: On a daily basis, leaving every interaction with a sense of accomplishment or understanding. On a macro scale, gaining more understanding on job creation. Definition of financial success: Reconciling and embracing both the qualitative and quantitative outputs of creative endeavors. 90-day goal: Achieve deeper integration in the business. 1) Getting people from different working spheres together to examine each other’s objectives, places of overlap and ways you can all support each other’s missions. 2) Find people to work with if you don’t already work with others. This can help you to see yourself and your business goals through a different lens. Get a free accounting technology consultation from SUM Innovation. Tell Mathew you heard him on the Life Skills That Matters podcast!